Napa senior Zach Swim (25) looks like he's doing a cheerleading stunt as he shoots against American Canyon's Oliver Aandahl, left, and Eric Thomas on Friday night. American Canyon junior Roman Madayag shoots between Napa's Brock Bowers, left, and Vince O'Kelley on Friday night. The Napa High boys basketball team poses with its VVAL Tournament championhip trophy on Friday night at American Canyon. American Canyon junior Oliver Aandahl shoots in front of visiting Napa's Brock Bowers on Friday night. American Canyon senior Sam Johannessen shoots over Napa junior Logan Van Zandt on Friday night. Napa senior Vince O'Kelley looks to lay it up against American Canyon on Friday night. American Canyon sophomore Gabe Patrick (15) blocks a shot by Napa's Zach Swim (25) on Friday night. Napa sophomore Brock Bowers (22) tries to shoot over American Canyon senior Sam Johannessen on Friday night. American Canyon head coach Brett Wedding talks to his team during a timeout against visiting Napa on Friday night. Napa High head coach Zack Cook talks to his team during a timeout against host American Canyon on Friday night. Napa sophomore Brayden Greenlee (5) is defended by American Canyon freshman Khai Curry on Friday night. Going for the opening tip are seniors Sam Johannessen, left, of host American Canyon and Zach Swim of Napa on Friday night. Napa senior Zach Swim (25) shoots over American Canyon junior Matt Clinton on Friday night. AMERICAN CANYON — The Napa High boys basketball team added to its trophy case with a Vine Valley Athletic League Tournament championship win, 62-48, on Friday night over host American Canyon. Zach Swim notched a double-double with 19 points, 10 rebounds and two assists, Stephen Blume chipped in 19 points with three assists and one board, and Brock Bowers had a typical all-around performance with 11 points, 12 rebounds and five assists as the Grizzlies shook off a poor first half to close out the game strong. The Grizzlies (23-5), who extended their winning streak to 16 games, ride into the CIF North Coast Section playoffs scorching. But win No. 23 didn’t come easily, as the Wolves (14-14) jumped all over the Grizzlies early en route to a 17-6 lead through the game’s first five minutes. “They came out with a good game plan and hit us in the mouth early,” Napa head coach Zack Cook said. “I knew they would have them ready to go. They were shooting really well from three and we just stayed the course. While many teams would be shell-shocked after trailing by double-digits early, the Grizzlies gave young ballers in the audience a perfect lesson on how to be calm and confident in the face of adversity as they went on an 18-8 run to cut the deficit to just 25-24 at the half. 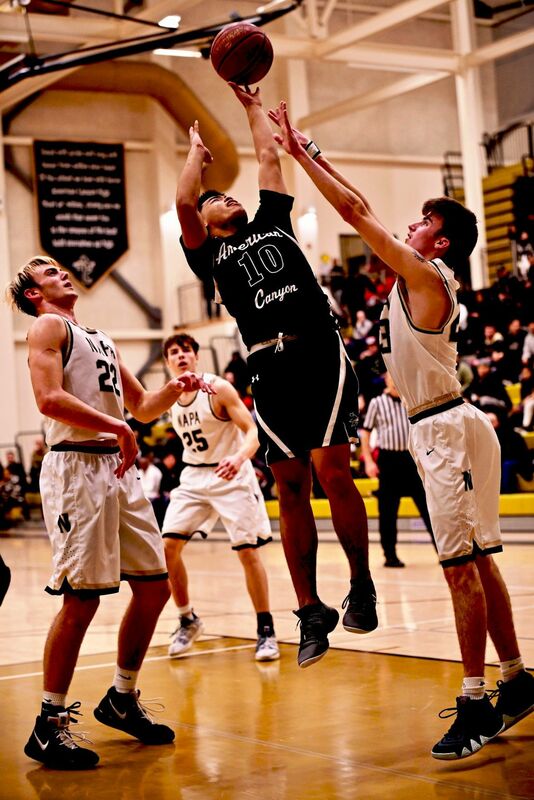 American Canyon received solid performances from Sam Johannessen (nine points, four rebounds, one assist), Oliver Aandahl (nine points, three rebounds, one assist), Gabriel Patrick (six points, three boards, one assist) and Max Parmigiani (nine points). But the wheels fell off for the Wolves late as their hot shooting faded and Napa seized momentum. After the Wolves came out of halftime with a quick bucket from Matthew Clinton, Napa turned on the jets and went on a game-changing 20-2 run that flipped the contest on its head and gave the Grizzlies a 44-29 advantage. Aided by a bevy of transition buckets, they turned defensive stops into fast-break opportunities and capitalized on nearly every chance. Needing a spark to get back on track, American Canyon got a surprise lift from Parmigiani, a junior varsity call-up who had been practicing with the team for less than a week. The sweet-shooting freshman got his team back on track late in the third quarter with three straight corner treys – all on perfect swishes – that helped the Wolves end the frame down only 46-38. “We just called him up for this week after he did really well on JV for us,” Wedding said. “Great shooter. He came in, did his job and hit a couple shots to give us a spark. As Napa pulled away in the fourth quarter, the minds of the American Canyon faithful began to wander toward a potential NCS Division II playoff berth, with “Selection Sunday” looming this weekend. After starting the season 1-8, the Wolves finished strong and believe they deserve a shot to make some noise in their inaugural season in a new section. Meanwhile, Napa has wrapped up a Division I berth and is just waiting to find out who it’ll play next. Already the winningest team in school history in their sport, playoff success is next on the Grizzlies’ to-do list. As VVAL champions, they’re guaranteed a home playoff game unless they match up against a higher seeded team that is also a league champ. Considering that the Grizzlies are 15-0 at Messner Gym and 8-5 everywhere else, home court advantage could make a big difference. In its first playoff game since 2005, Napa will look for its first postseason victory since it beat Downey 53-49 in the first round at home on Feb. 21, 2001. Andy Wilcox contributed to this story.